1. Preheat your oven to 350 Degrees Fahrenheit and line both of the cookie sheets with the wax paper. Take one of the cookie sheets and set the almonds on top. When the temperature is reached, toast the almonds, typically for 7-10 minutes. Youâ€™ll know theyâ€™re done by the smell. 2. While the almonds toast, set up your double boiler (a pot of hot, but not boiling water with a heat-resistant mixing bowl set on top of the pot, which does not actually touch the water, just receives the heat). You can always just melt your chocolate in a microwave-safe bowl in 30-second intervals. 3. Remove the almonds from the oven. I like to do this before tempering the chocolate because you need to constantly stir the chocolate as it melts; if you are busy fetching almonds from the oven, then your chocolate isnâ€™t being stirred and is thus burning. 4. Pour the dark/semisweet/bitter chocolate into the mixing bowl of the double boiler and stir constantly until the chocolate completely melts. 5. Remove the mixing bowl from the double boiler and add the almonds, cherries, and amaretto. Stir generously until all the ingredients are evenly distributed. 6. 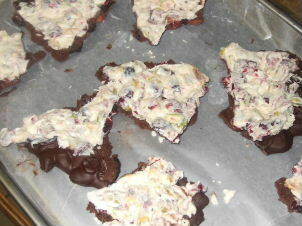 Spread the mixture onto the second cookie sheet with a spatula. It does not need to cover the whole sheet. Just make sure itâ€™s evenly spread. 7. Set the cookie sheet in the fridge for 15 minutes. 8. Repeat steps one through five and substitute the white chocolate, cranberries, and pistachios for their counter ingredients in the already cooling bark. Note: the pistachios will need probably only 5-7 minutes to toast. 9. Remove the cookie sheet from the fridge and spread the white chocolate cranberry pistachio mixture over the set dark chocolate one. 10. Place cookie sheet back in the fridge for at least 30 minutes or until sufficiently cooled. 11. Remove the cookie sheet, and using your hands, break off chunks. If you donâ€™t like touching your food, set a paper towel over the bark, and using a rubber mallet, crack the bark into pieces. So is my bark top dog or does it just have no bite? You wonâ€™t know until you make it and try it for yourself! And as always, customize to your liking. Maybe you want the whole thing in dark chocolate. Maybe apricots sound amazing with the pistachios. Or you could completely come up with your own recipe completely unrelated to mine. Just like there are many types of dogs in this world, so too are there many types of bark, but I assure you there is a specific one to please each person. Now, if only I had the cullinary skills to actually cook this. Looks good, I have a melting tip. 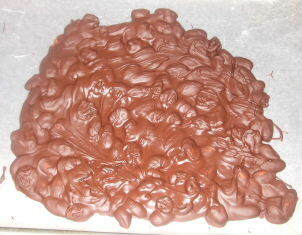 I got the wilton chocolate/candy melting pot, and it works amazingly well. Non stick, sort of like a little crock pot with a metal liner with a handle, and when the chocolate is melted you can turn the switch to WARM. I made dipped chocolates and it was so nice to not have the chocolate seize up and have to be re heated. Also would work great for a quick little choc fondue!!! !